Gather inspiration from foreign languages ​​and cultures! The Languages tool can find translations for your keywords in up to 91 languages with a single click. Try out which of your ideas sound especially original or beautiful in another language. Who knows - maybe you'll find an unexpected, inspiring word, or even a first name idea? The Languages tool will quickly expand your Word Depot with numerous foreign terms that fit your project's topic. You will find original translations for your keywords in familiar languages ​​such as Spanish, Italian or French. If you like a more exotic approach: No Problem! Translations to uncommon languages ​​such as Finnish, Latin and Esperanto are also available. Our insider tip: Swahili words sound original, beautiful and often evoke positive associations. In addition, having an exotic name is always good when one's product or company name is to be explained in a brochure or on the website. Test the translation tool now! You can test the translation tool right here on the page and perform up to five queries. Enter a single word and have it translated into up to 21 languages with just one click. 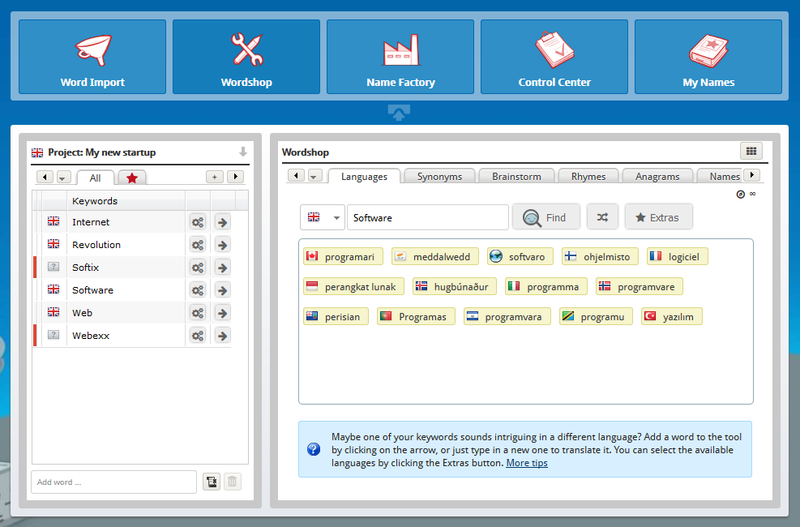 Go to the Languages tool in the Wordshop right now! If you don't have a NameRobot account yet, simply register and start looking for a name!